You are currently browsing the tag archive for the ‘grey-headed flying foxes’ tag. A bat huddle in the Wolli Creek camp 2015. 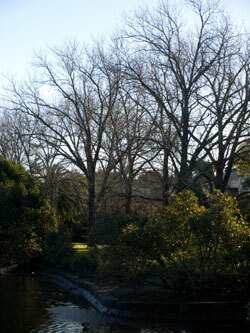 In the Wolli Creek Preservation Reserve along Wolli Creek is an important bat colony. 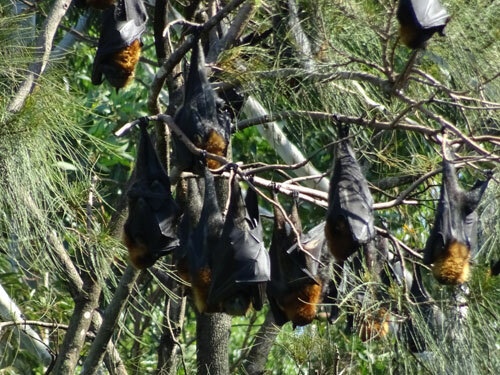 The camp started in 2007 when Grey-headed flying-foxes first set up a seasonal camp in the Wolli valley. Numbers then were a few hundred. In 2013 Wolli Creek became a permanent camp. Numbers fluctuate, but generally amount to around 12,000 endangered grey-headed flying foxes, so it is a very important camp. For the first time in years the Wolli Creek bat colony is empty. The Wolli Creek Preservation Society sent bat count volunteers an email about changes with the camp. On 21st March 2016 there were still a lot of bats on the north side of Wolli Creek. On 3rd April flying fox numbers were lower than expected with no bats at all on the north side of the creek. Bat numbers were estimated at between 1,000 to 5,000. Just two days later the Wolli Creek camp had emptied. The Gladesville camp has been empty since May last year Clyde camp has been empty between January & March. On 31st March 2016 Macquarie Fields & Cabramatta camps were empty. The Myles Dunphy camp remains empty. Numbers doubled in the Centennial Park camp from February to March 2016. The Gordon camp went from tens of thousands to empty in days. So where have the flying foxes gone? No-one knows yet. 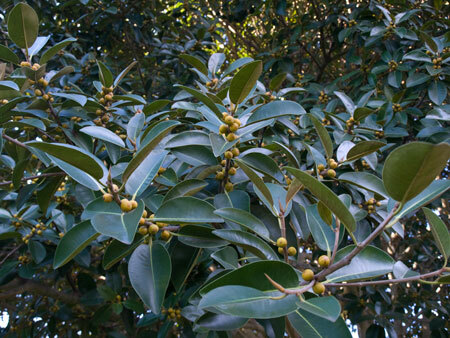 Observers reported that there were lots of flowering trees around Nowra, as well as in the Hunter. Perhaps the bats have left in search of better food. 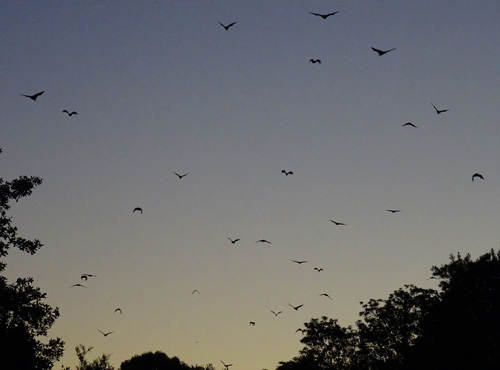 Every month since 2008 volunteers for the Wolli Creek Preservation Society count the bats from Turrella Reserve as they fly out for the night. This is the first month where there will be no count since this initiative started. I will miss the sight of flying foxes above every evening. However, it’s good to know that they do move around. This may help lessen some anti-bat attitude in the community. Bats galore in Wolli Creek. It’s a wonderful sight. Grey-headed flying-foxes are listed as a threatened species in NSW & classified as ‘vulnerable’. Like much Australian wildlife, loss of habitat is the main reason why their numbers have declined. Because their usual food-sources are scarce, they can seek food in urban gardens. WHERE: Arncliffe Community Centre. 1-2/35 Forest Road, Arncliffe. 1. Q: Did the Minister fail to take into account a relevant consideration when exercising his power of approval. That consideration was the impact on the GHFF resulting from their removal from their critical habitat in the Gardens. A: The Minister concluded that the proposed action should be attempted if the GHFF could be acceptably & safely dispersed in order to prevent ongoing damage being occasioned to the internationally significant trees within the Gardens. Thus, the Minister did not fail to consider the loss of the GHFF habitat in the Gardens and the draft Recovery Plan. 2. Q: Did the Minister fail to take into account a relevant consideration, namely the social matters & the associated community conflicts resulting from the dispersal of the GHFF to areas outside the Gardens. A: The portion of the Reasons under the heading ‘Social & Economic Matters’ demonstrates that the Minister has given due regard to information on social matters identified in the PER & in public submissions. 3. Q: Did the Minister fail to take into account all adverse impacts, present & throughout the duration of the approval, that the approval would have on matters protected by Part 3 of the EPBC Act. The approval is stated to remain effective until 2039. The applicant does not identify the impacts which have allegedly been disregarded by the Minister. Rather, the submission merely suggests that there may be cumulative impacts which will adversely affect the GHFF. A: Based upon the precise nature of the monitoring, which will continue throughout the life of the approval, & upon which the life of the approval is contingent, it could not be said that the Minister failed to consider how the approval would operate to the date of expiry. 4. Q: Did the Minister fail to take into consideration other information in the Minister’s possession concerning similar GHFF dispersals which had been raised in public submissions and referred to in the Independent Expert Report of Dr Richards. A: The Minister was aware of the potential for the proposed action to be unsuccessful. In these circumstances, the Court cannot conclude that the Minister failed to consider previous unsuccessful attempts to disperse colonies of GHFF in Australia. That still doesn’t make the decision the right one & the court hasn’t answered this question. According to bat experts, dispersal techniques will make the bats tired & stressed, making them prone to serious injury. They will have to join other colonies to fight & compete with food that was, at least during 2010, very scarce. Bats were found all along the east coast of Australia & as far as Adelaide looking for food with some eating citrus fruit in country orchards, although citrus is not their usual food. The east coast situation of starving bats has resulted in an increase in anti-bat sentiment in the community with many complaining about bats in their garden keeping them or their children awake at night. This blog’s stats show with alarming regularity people searching the question, “How to get rid of bats?” I know what the answer will be. Some people will chop down their trees to take away the food & the tree/s that the bats are using. No tree, no bat. I predict there will be a great increase tree removal & despite the rules & regulations of Councils, many won’t bother to get permission. Our Council wouldn’t know the true numbers of tree removal across Marrickville LGA & I’d bet this is the same with other Councils. 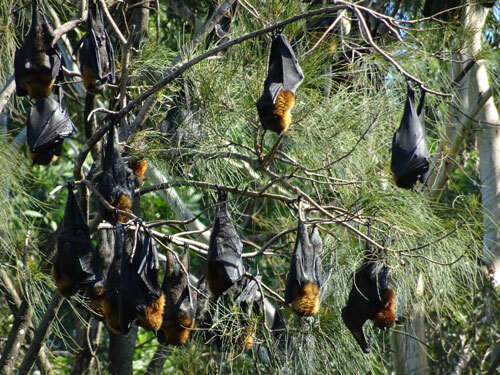 Sydney Councils have been saying throughout 2010 that they did not want the 22,000 Botanic Gardens flying-foxes to come to their area so it’s not as simple as removing the bats from the Gardens for them to happily fly away to another home. Their removal will have a ripple effect & I doubt it will be supportive of the bats. I appreciate the situation that the Trust is faced with & understand why they sought the eviction. However, there are many others like me who are sad & disappointed about this decision, who believe the bats should be allowed to continue to live in the Botanic Gardens & that their eviction will create many more problems for bats & other birds. It is also an enormous loss of opportunity for ‘natural tourism,’ as many people would travel to see such a glorious sight right in the heart of our city. Let’s hope that everything works out quickly so everyone can be happy, most of all the bats. First the RTA tried to build their highway over the Cooks River & the Tempe Wetlands. Not content with that defeat, now they are going after Wolli Creek, the only remaining piece of inner suburban bushland that is largely as it was when white people came to settle in Sydney. It is more than precious. 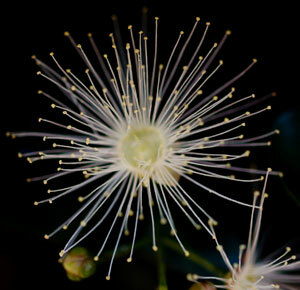 It is astoundingly beautiful in parts & a haven for urban wildlife, including flying foxes. We should be doing all we can to protect it for future generations, not having to fight the RTA & the state government to save it. The state government promised to hand over the remaining section of Wolli Creek to National Parks & Wildlife Service 12 years ago. What happened? Why have they not lived up to their promise? Putting a highway through a section of Wolli Creek will harm this area immeasurably. 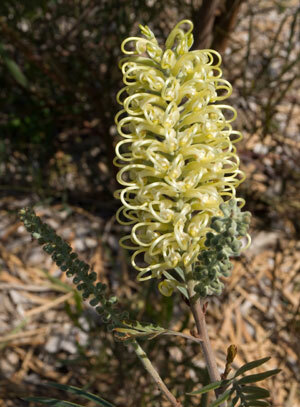 It is only a small pocket of bushland & is surrounded on all sides by roads & housing. A rail line runs beside it & planes fly overhead. To further stress the area with a highway will have major consequences on flora, fauna & water quality. 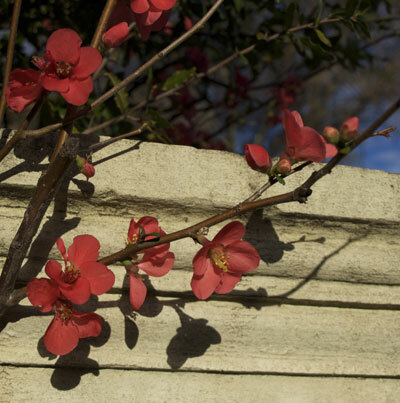 Wolli Creek is home to rare frogs, orchids, many species of birds & the grey-headed flying fox that is listed as ‘vulnerable.’ More than 260 native plants have been identified within the Wolli Creek Valley. I hope that people from the community, including those who don’t live near or use Wolli Creek will help with the fight to stop the RTA bulldozing Wolli Creek. 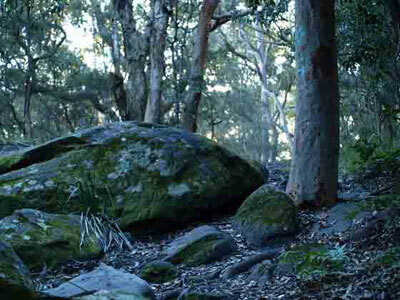 This beautiful piece of bushland must be saved for future generations. Hundreds of volunteers have worked on the Wolli Creek bushland for years. They have been doing this to preserve this space for wildlife & for the heritage value & amenity of people. As I hear of any action relating to save Wolli Creek from the M5 I will post about it. There will be people who say a highway is more important than a piece of bushland. I disagree. 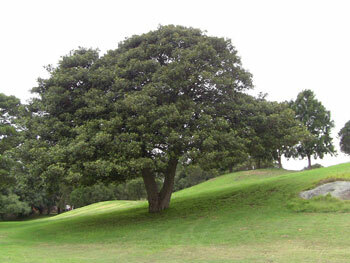 Wolli Creek is not an ordinary piece of bushland & I think many others feel likewise. I was excited to read about a report commissioned by the NSW Department of Environment, Climate Change & Water. 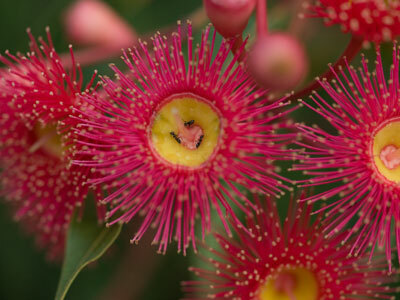 The report, Connectivity Conservation & the Great Eastern Ranges Corridor, recommends the establishment of a conservation corridor spanning 2,800 km along the Great Eastern Ranges from the Australian Alps in Victoria to the Atherton Tablelands in Queensland. It’s a fantastic idea & will go a long way to helping wildlife. Hopefully it will also help the Koala who are seriously at risk of extinction from loss of habitat in Australia. The Pew Environment Group did a recent study that found the area from the central west of NSW, up to Cape York, across the top end & down to the wheat belt in Western Australia, absorbs more than 9.5 billion tonnes of carbon. They say that if this area is managed properly, it could reduce carbon pollution by 5% by 2050, the equivalent of taking 7.5 a million cars off the road every year for the next 40 years. In Australia, soil is being lost 5 times faster than it is regenerating through natural processes. In the United States, it is being lost 10 times faster. In Europe it is being lost 17 times faster, and in China, an astonishing 57 times faster. Hopefully, farmers will take notice & the government will provide the funding to help them regenerate the natural vegetation without too much delay. I read 2 articles about Railcorp recently. The first reported that Beecroft residents were furious at tree-lopping & removal at a site marked ‘environmentally sensitive’ along railway land near Beecroft Railway Station. It’s a shame because Gang Gang birds lived in those trees. City Rail said, “The trees lopped were wattles which had become a safety hazard. The trees we removed were predominantly wattles (Acacia) that had been planted by Railcorp around 10 years ago inside the rail corridor.” In response the Beecroft Cheltenham Civic Trust employed a professional arborist to assess the tree removal. They found young Eucalypts & Acacias had been removed. 3 weeks later in an article about Railcorp’s plans to replant the stripped area, a RailCorp staff representative said, “the plants had to be removed because 95 per cent of them were noxious species.” Wattle a noxious species? 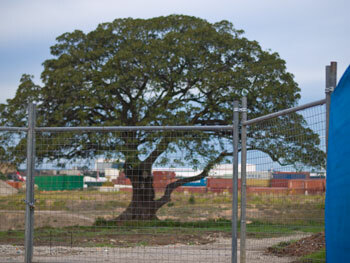 Railcorp intend to replant with native grasses & shrubs, but no trees. 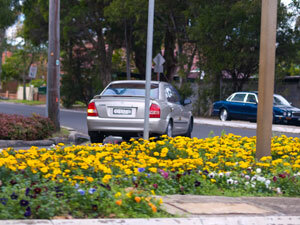 Epping residents also complained that everything near the railway station has been stripped, including the grasses. Both communities complained about the lack of community consultation. To my understanding, being government-owned land, they don’t need to notify the community. That the community expects that they do tells me that trees & habitat for urban wildlife are becoming important issues for the community. I think this is a good thing. Lawrence Pope, the president of the Victorian Advocates for Animals wrote a fantastic letter to the Bendigo Advertiser about Grey-headed flying-foxes that I would love to post in full. Unfortunately copyright prevents me from doing so, but I sincerely hope that any readers who dislike bats, are afraid of them or have concerns about their presence around Sydney of late take the time to read this letter. It’s not a long letter as Mr Pope has the skill of writing succinctly. Lastly, I missed Saving Our Tree’s birthday. 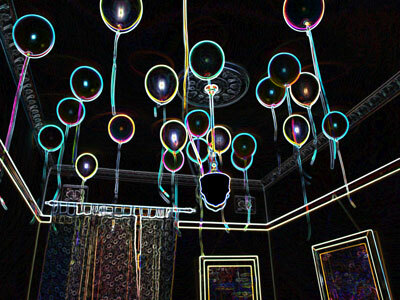 We were 1 year old on 16 June 2010. Isn’t that lovely. A very big thanks from me to everyone who has supported SoT by reading this blog, sending submissions & for all your ideas & words of encouragement. Don’t know what to say except the trees & the urban wildlife have hooked me & I couldn’t imagine not doing this.